Trekk heat transfer machines are currently being used around the globe by many of the world's leading apparel manufacturers because of their speed, reliability, and print quality. The HT300 series machines apply pre-printed heat transfer labels to a variety of fabrics and garments using precise amounts of heat and pressure within specific dwell times. 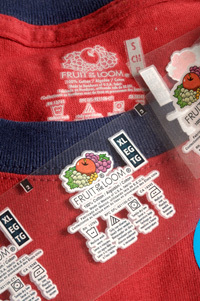 Our HT-300 line of equipment is designed to ensure top quality labeling every time. Work Table Size 6" x 8"
Optional Size 3" x 3 1/2"
Force Output @ 95 PSI 300 lbs. 2. Motor-driven, multicolor heat transfer indexing system with photoeye and fine tune image adjustment.